Question: What role did Steven W. Taylor play in the rescue of the Martin Handcart Company? Answer: Stephen Wells Taylor was born on December 25, 1835 in Dukenfield, Cheshire, England to George Taylor and Catherine Broadbent. Stephen joined The Church of Jesus Christ of Latter-day Saints with his parents in England. His father, George, died in Nauvoo in 1845, and his mother died in Nauvoo in 1847. Stephen was only twelve when he traveled to the Salt Lake Valley on 12 October 1848 with the Brigham Young company. Stephen was endowed in the Endowment House on November 22, 1855. On 28 July 1856 a handcart company under the leadership of Edward Martin left Iowa City, Iowa, and started across the plains to the Salt Lake Valley. By October, cold weather and snow caught them in the mountains in central Wyoming. Short on food and other supplies, members of the company experienced exposure to cold, hunger, and exhaustion, and some began to die. They would suffer more losses than any other pioneer handcart company. 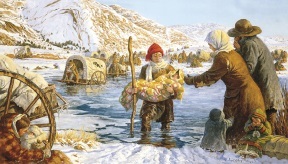 When Brigham Young learned that there were still many Saints out on the trail, he sent a rescue party that included Steven W. Taylor with supplies to help bring the people to Salt Lake. The rescue party members met up with the Martin Company in late October about five miles from Devil’s Gate with their limited amounts of food and supplies. With the rescuers' help, they struggled on toward Salt Lake. Stephen carried some of them across the Sweetwater River on his back. He was not particularly tall, but very stocky and strong. It took them until sundown to get all the Saints and their handcarts across the river. Stephen at the time was 21 years old and was engaged to marry Harriet Seely. Stephen and Harriet were married and sealed on March 15, 1857 in the President’s Office in Salt Lake City. Living in Utah, Stephen became a farmer and a stockman. He served a mission to England from 1869-1871. Stephen and Harriet had nine children, seven of whom grew to adulthood. In December 1872, Stephen married Mary C. Evans in polygamy. Stephen and Mary had ten children, all of whom lived to adulthood. Stephen served as the sheriff of Salt Lake County from 1874 to 1876, served in expeditions against the Indians, and was engaged for several years in protecting the mail service to Utah. 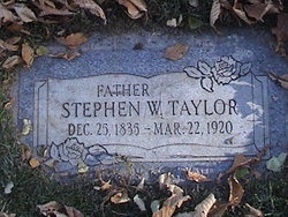 Stephen died on March 22, 1920 in Salt Lake, and is buried in the Wasatch Lawn Memorial Park in Salt Lake City, Utah.